ASIBOT is a manipulator robot with 5 DOF, about 10 kg of weight, 1.3 m of reach and 2 kg of payload. The feature that makes the robot unique is the fact that all the control system is on-board. It needs only 24V external power supply for start working. This is why the robot is totally portable with the weight and size (after homing) that enables it to be transported, for example, as a hand bag on an airplane. The robot has a symmetrical structure and is equipped with special conical connectors on each tip. This configuration makes it able to climb between static and very simple docking stations situated in the environment. The climbing ability of the ASIBOT transforms it into a mobile robot able to move in domestic and office structural environments. 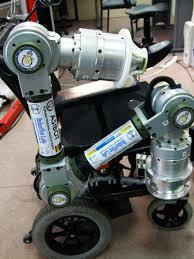 The robot applications are oriented mainly to domestic assistive tasks for elderly and disabled people. The robot has a three finger (with 8 flanges) gripper inside of each tip conical connector to manipulate different objects or tools. The applications that have been tested in real environments and with real patients are: eating, drinking, shaving, make up, teeth brushing, etc. The robot has been under testing in the National Hospital for Tetraplegics in Toledo. Metodología de diseño óptimo para la construcción de robots de servicio, Castejón, C. ; Gimenez, A. ; Jardon, A. ; Rubio, H. ; García Prada, J. C.
Conference Metodología de diseño óptimo para la construcción de robots de servicio, Castejón, C. ; Gimenez, A. ; Jardon, A. ; Rubio, H. ; García Prada, J. C.